Like Alexander or Caesar, the name of Saladin the great foe of Richard the Lionheart, a great figure of Islamic history has a timeless quality. As famous today as he was when he drove the Crusaders out of Jerusalem, the real Saladin has dissolved into legend with each generation’s retelling of his story. Through the ages he has made many numerous appearances in both classic and popular culture: Dante placed him in the first circle of Hell with the heroes of Troy and Rome while Rex Harrison played him as a cad in the film King Richard and the Crusaders. In Youssef Chahine’s epic film Saladin, he emerged as a hero of Arab socialism, and he has even made an appearance in an episode of Dr Who. Even today, Saladin’s historical influence continues with various Muslim/Arab leaders all claiming to be his military and spiritual heir. The first major biography of Saladin for twenty years, and the first by a Muslim historian to appear in English, Dr A. R. Azzam’s timely and fascinating account is essential reading for anyone interested in the medieval Crusades, Islamic history and the origins of the modern Middle East. Copies will be available for purchase at the event alongside opportunities for book signing and questions related to the subject with author! Ṣalāḥ ad-Dīn Yūsuf ibn Ayyūb (1137/1138 – March 4, 1193), better known in the Western world as Saladin, was the first Sultan of Egypt and Syria and the founder of the Ayyubid dynasty. A Muslim of Kurdish origin, Saladin led the Muslim opposition to the European Crusaders in the Levant. At the height of his power, his sultanate included Egypt, Syria, Mesopotamia, Hejaz, Yemen, and other parts of North Africa. In this new edition, the author A. R. Azzam traces the historical rise of the great Kurdish general and the dramatic events starting in Baghdad with the disintegration of the Abbasid caliphate, and introduces great figures such as Nizam ul-Mulk, Nur ud-din Zangi and later his famous victory at the battle of Hattin. The author also examines how Saladin became a legend in his own lifetime and how and why the legend has continued to endure so powerfully to the present age. The author goes beyond the myth and argues that the legend of Saladin’s chivalry has neglected his inner spiritual life and beliefs and the vital role he played in upholding religious orthodoxy and impact of al-Ghazali. 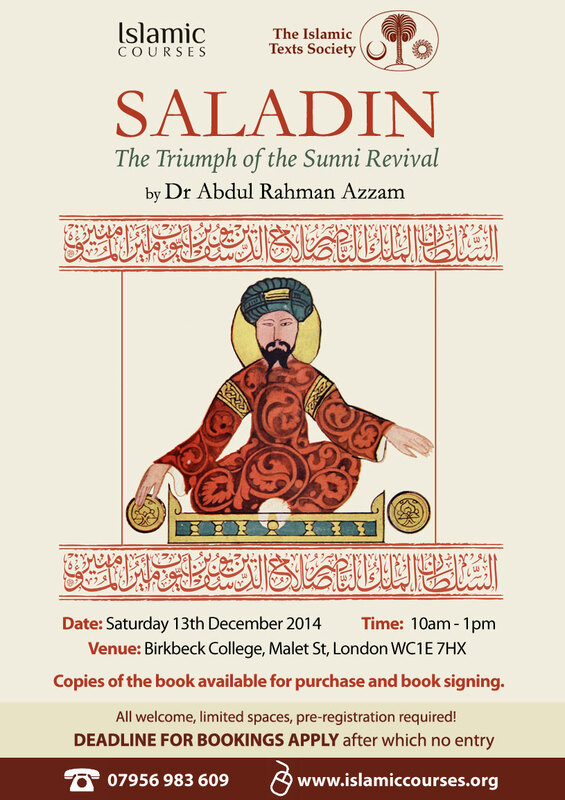 And although this may appear to have little relevance in a biography of Saladin, A. R. Azzam argues that Saladin was in reality a child of the Sunni Revival and that it was the ideals of this Revival which more than anything affected his beliefs and actions and constitute the foundations of the greatness of his political and spiritual vision. Thus the book is not just the study of the man but also the study of the historical age in which he lived and of the profound intellectual forces that influenced his thoughts and actions so deeply. It is a study of the power of an idea and how this idea, the Sunni Revival, began to take root and flourish in the century before Saladin was born and spread rapidly across the Muslim world—from Baghdad to Damascus, from Damascus to Cairo and ultimately and triumphantly, thanks to Saladin, from Cairo to Jerusalem. In this BOOK REVIEW SEMINAR, you will have a chance to listen and hear from the author, ask any questions and finally copies of the book will be available for purchase at the event alongside opportunities for book signing. Dr Abdul Rahman Azzam obtained his doctorate in Islamic Studies from Oxford University, specialising in Islamic history. 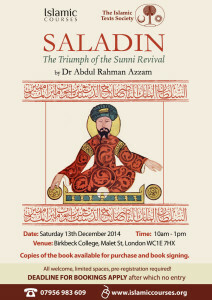 As an independent Muslim scholar with access to both original Arabic and western sources, has given him a uniquely authoritative perspective on Saladin and the Islamic world of the period.